This custom designed center console not only runs the boat, but also provides a dry storage for guns, bags, ropes, emergency equipment, and seating. Purchasing a new or used fishing boat and transforming it into a multi-use duck boat is one of the most satisfying projects that a waterfowler can undertake as an off-season project. You get to customize the rig to meet your needs, adding lighting, storage, blind attachment, retriever needs, and other accessories that you prefer to see included on a duck boat. Following are the details on how one duck hunter developed his customized waterfowling boat. When Bryan Ellis' dad first sat him down next to him in the pre dawn stillness on the marshy edge of a pond some 30 plus years ago, waterfowling quickly became an adventure in discovery. He shot his first duck that day, a drake mallard. Coming straight in toward the father and son team, Bryan can still hear his dad saying, "Here they come--pick your bird son--don't move yet. Wait--wait--take em!" Putting his dad's JC Higgins 12 gauge pump to his shoulder, Bryan took aim, pulled the trigger, and the duck landed stone-cold, five feet from the two of them. The cold splash soaked him, taking his breath away. As his dad chuckled, he patted him on the back saying, "That's the way to do it son." Every trip is in pursuit of a memorable adventure, but like most of us with similar experiences, Bryan doubts any will ever compare with that special first hunt. Back then Bryan and his dad hunted from private box blinds or make-shift shore blinds in Back Bay and the James River in Virginia. Over the years his dad and most of his hunting buddies passed away along with the rights to hunt those blinds. So the majority of Bryan's waterfowling these days is done from a floating blind. Fortunately, the Virginia Wildlife Management Commission recognizes the need for public access waterfowl hunting habitat and has set aside some premium tracts specifically for that purpose. The most accessible, only 20 minutes from his home, is the Back Bay WMA. Back Bay is about 7 miles across at its widest point and a 20-mph wind can whip up some nasty waves. While this water body is brackish, the water level depends mainly on the wind not the tide. Back Bay opens to the Currituck Sound to the south and dead ends to the north. For most of the creeks, coves, and marsh of Back Bay, what is today knee deep and navigable is tomorrow, two digits deep and inaccessible. After only a day of strong northerly winds the water gets blown right out of the Bay. This low-water condition can make for some of the best gunning Back Bay can offer because the marsh pot holes drain, leaving only shallow creeks, coves and bigger water for ducks to sit on. To hunt Back Bay in varying conditions requires a floating blind constructed specifically for these varied conditions. The ideal rig would be one that is strong and seaworthy and big enough to comfortably carry three men, gear and dog to bust through wind-whipped 3-foot chops. A stealthy and powerful and lightweight rig is needed to get up a six-inch-deep creek. Bryan discovered the perfect floating blind for less than perfect conditions on his third attempt at construction. He started with a solid foundation, a SeaArk 1652 MVT. Bryan fortunately came upon a two-year-old model that the dealer couldn't find a home for. He had to drive 200 miles to pick it up, but it was exactly what he was looking for at a bargain price. As far as the length, longer boats may ride a little nicer in rough water accordingly to Bryan, but he doesn't like more than three gunners in the boat and the risk of an accidental shooting is reduced by keeping everyone sitting as close to one another as possible. This boat is wide. The 52-inch width at the stern allows for more horsepower without causing the boat to squat deep in the water. It's a solid, all-welded aluminum boat with USCG foam floatation. For power a slightly used 40 hp (max for this hull) Yamaha with a SST low-pitch prop on a new Panther power tilt/trim bracket. The tunnel hull, Panther Bracket, and prop combination allow navigation in only four inches of water with a full load. The motor/prop combination will push the boat to about 34 mph, plenty fast enough for running in the dark. It gets the waterfowlers out of the hole quickly, provides plenty of power for big water conditions, and gives plenty of RPMs at a slow plane for cutting through submerged aquatic vegetation. The boat has a bench seat in the rear and a platform in the bow that works great for decoy storage. After searching unsuccessfully for a center console to meet Bryan's needs, he designed one. The console was fabricated and welded to the ribs of the hull at a local sheet metal shop. This console is the heart of the functionality of the boat. The console provides dry storage for guns (permanent gun rack), lifejackets, blind bags, paddle, ropes, stern light, emergency equipment, etc. The lid serves as a comfortable spacious seat for two hunters. A cushion from a 126-qt cooler was covered in camo material and rests on the lid. Noiseless latches are made out of bungee cord to keep the lid secure. A holster is made to hold a 1,000,000-candlepower hand held spotlight. The holster is welded to the side of the console and secures the spotlight for quick access. An accessory plug is mounted near the holster for power. A light inside the console turns on automatically when a proximity sensor mounted near the hinged lid senses the open position of the lid, and a spring hatch support keeps the lid open. Courtesy lights are mounted on all four sides of the console to illuminate the inside floor of the boat. The lights make getting ready for shooting time very convenient. A section of two-inch diameter aluminum pipe bent at a fabricating shop and welded to the top of the console serves as a grab bar. 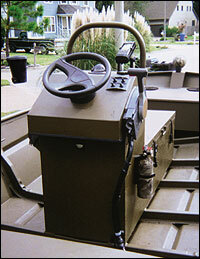 Other items mounted on the console include a quality compass, GPS bracket, switch panel, and 2.5 turn helm. Navigation lights, courtesy lights, bilge pump, and spot light are controlled independently at the waterproof switch panel. Bryan used 3/4" treated plywood backing support on the helm station. Fused buss bars are screwed directly to the backing inside and make the electrical connections a snap. A 2,000-gph bilge pump is piped to discharge over the transom. Adding a second one for safety purposes also makes sense. The aluminum cleats were saved from a Mako and re-fitted years ago and welded them inside the gunnels. They work well for tying off the boat. Removable panels on each side of a bow bracket allow for easy access to wiring and components. The chrome on the spotlight was covered with cloth camo tape. The spotlight came with a plastic cover. Bryan made a safety lanyard to keep the cover from disappearing by crimping a length of 400lb mono fishing line from the plastic cover to the mounting bracket. Safety lanyards were also made the same way for the transom plugs. There he sat, in ankle deep water 100 feet from anything, the blind looking like a boat with a pop-up blind and the ducks agreed. He got skunked on a Wednesday, took the pop-up off that night, bought the parts and built an EMT (extruded metal tubing) frame on Thursday. On Friday he brushed it with natural vegetation, then shot his limit on Saturday. Same spot and conditions. Bryan tried the pop-up rig for the first time last year and its quick and easy but natural feel is definitely better. The rig now looks like any other clump of marsh. The frame is constructed using 3/4-inch EMT and double-bolted with stainless steel hardware at every joint. The shooting opening is as small as possible, still giving access to the boat. Integrated into the frame are 3 hinged doors; one port-forward for the crew, one starboard-aft for the hunter, and one port-aft for his retrievers, Hunter and Jessie. Bunge cords are used to keep the doors open for picking up decoys. Galvanized garden wire fencing is used for backing and the rig is brushed with Fastgrass. Now this rig can be set up anywhere blending in well with surrounding scenery. A dog ladder is made from left over PVC and treated lumber. Drill holes in the underside of the last step (pipe) to allow water to flood the assembly. Six-ounce lead weights inside each bottom pipe compensate for the ladders' bouncing. It's strong, works great and cost pennies to make. A stern light mount is fabricated and welded to the port rear gusset. The stern light stores in the console when not in use. Finish off the wiring harness by wrapping all of the harness components with spiral wrap then locking it down with nylon hold down clamps. Installed was a battery on-off switch to insure an open circuit that prevents drain on the battery. Everything was painted duck boat brown and with camo graphics with a cardboard pattern. A used trailer that tilts for shallow water launches, new tire, bunks, and rewiring complete this rig and saved Bryan hundreds on the initial cost of the trailer. For concealment a pop-up blind is made out of PVC. Bryan used leafy-cut Cerex and lined it with a camo tarp. The pop-up functioned well, but mid-way through the season he lost all confidence in it. When the water is really low and you must set up in the open you tend to be very visible.